Separates and isolates Forward (54-1000 MHz) from Return (5-40 MHz) signals providing for Combined/Separated Distribution for clean mixing with headend strip amplifiers, HSI return Blades and Return Band Loop Arounds. Allows the combining or separating of return signals sub-bands (5-40 Mhz) and forward signals (54-1000 Mhz). Also provides low loss sub-band signal insertion in the distribution system or at the Headend at RG6 Coaxial Cable Level, allowing Flexibility in combining network lay-out and design. Allows one-way amplifiers to become two-way. Separates return signals (sub-bands) on Headends and provides low loss sub-band signal insertion in the distribution system or at the Headend. 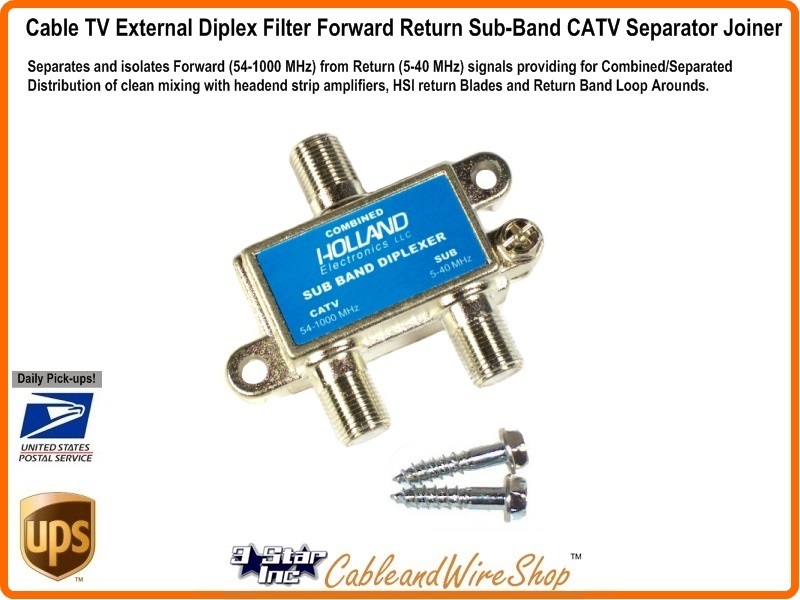 Note: This Diplex filter performs the same function as those found in CATV Amplifiers when separating Forward and Return Frequency Bands. Analog TV channels can still be used and mixed into your premise (Home or Office) Distribution System. Some insertions and combining can be simply by using a 2-way splitter in reverse (the two outputs are now two inputs). Passives like cable TV splitters are not directional in that regard, their directionality comes into play by increasing port to port isolation (between outputs) thereby reducing port to port feedback and interference. If you are mixing two sources that do not have any channels (Frequencies) in common and each occupies a different portion of the spectrum, the 2-way splitter can work. If you are combining satellite and Off Air TV antenna signals and wish to do so cleanly, with the hopes of separating them again at the other end of the cable (done to use one cable coming in the house rather than two), you would use a combiner separator used for that purpose, If you want to combine a DVD, VHS Tape, Xbox or similar channel 3/4 device output into your TV antenna or cable TV feed, you would select a CH 3 or 4 combiner. If you have a cable or Satellite feed and you want to mix video coming from a camera or similar device, understand that it is raw and isn't "Modulated onto a TV channel yet. You will need a Modulator that is frequency agile so you can find an "Empty" Channel or piece of the spectrum that is not currently being used by the feed and simply use a 2-way to combine them. Plug the feed into your TV, select the appropriate feed typoe from your setup menu and see what empty channels exist. Even HDTV's still tune analog channels, so you get bang for yuour buck. Sometimes mixing VHF and UHF antenna feeds (with a 2-way) is advantageous as the collected signal strength is additive. If it is not additive, but is out of phase and reduces signal strength, then use a UHF/VHF Separator/Combiner for this purpose.